aaaah!! pagaria per tenir una foto com aquesta del Monasterio de Piedra, les meves son una mica cutres, jo a pols trec "xurrus". Possiblement no en pujaré cap!! M'encanta el processat i la llum, donen un ambient màgic, bon treball i bona captura, ets un crac!!! Spectacular! It's like 3D! The depth, light, and movement all work together to make this one of the most stunning pictures ever! Breathtaking shot. Very dreamy... almost too good to be real. Impressionant paisatge, el processat es espectacular, es un molt bon treball, et felicito un altre cop. Molt bona, una delícia de paisatge. Wow! It looks like you have captured a place where fairies and magicians live. The golden light and the frozen waterfall are truly beautiful. 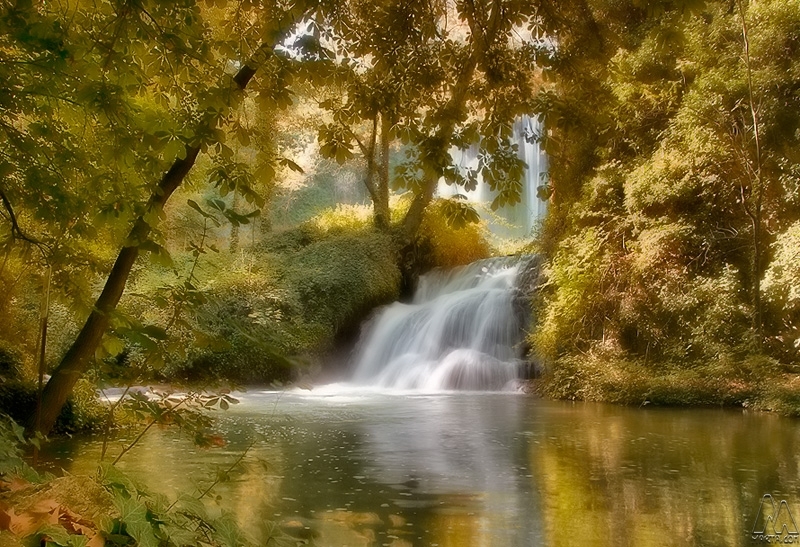 Absolutely beautiful, love the tones and the silky waterfalls. A gorgeous dreamy setting. You show us how wonderful the world is! Das ist gemein mich jetzt über einen Monat auf die Folter zu spannen ;-)) - Toll gemacht, ich gehe mal davon aus der gleiche Effekt wie beim vorherigen Bild. Bin mal gespannt wenn Marta aus dem Nähkästchen plaudert. Zum Motiv finde ich dieses Postprocessing absolut passend. Sehr feine Arbeit. Die herbstlichen Farben schaffen eine schöne Atmosphäre. Mensch bin ich froh zwischendurch auch mal meine Eindrücke in meiner Muttersprache zu verfassen zu können. In Englisch fallen mir halt nur 3 Brocken ein. Mancher muss sich denken, der hat auch nichts neues auf Lager, Nuria z.B. Bis die Tage ... ich bin dann mal weg .. I'd surely escape into another world in a place like this. Like a dream!!! Love the golden glow..the composition..everything about this. WOW! Wonderful softness and shutter speed. Love the perspective. Una toma bellísima con un efecto seda muy bien conseguido y un tratamiento de lujo. Un ambient oníric molt ben aconseguit. Sembla que hagi de passar pel mig una fada o un elf en qualsevol moment... Felicitats. Wunderbar weich ... wie aus einem Märchen. It seems this came from a fairy tale. Very good. Only the fairies are missing ;) Maybe they are on they way? Absolutely beautiful! A land of make believe. Besides the photography, your processing is awesome too. Absolutely stunning. You really have a way with the soft sharpness, amazing image! That's so dreamy... as if a magical creature can come out behind that trees every minute. Love the golden tones. Very Nice! The geek in me originally thought this could be perfect for a scene from Lord of the Rings. Un crac, aixo si...com domines, eh? No conocía tu trabajo, estoy revisándolo y lo veo genial. Ach wie idyllisch. Soooo schön! What a beautiful and tranquil scene. Love the slow shutter water and the interesting colors! it's like in a fairytale! nicely composed and exposed picture. Great photo with a dreamy effect (like the orton effect) and as always that great warm colors! Like it is a dream. Great warm colors. The long exposure is well done. Grat Photo Friday nature entry. Love the way the leaves glow.